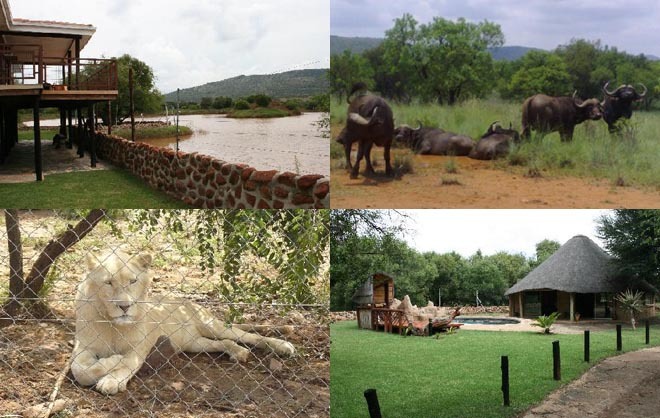 Mvubu Game Lodge is situated on a 600ha farm in the Swartruggens district, only 2 hours from Santon and 50 km from Sun City in a Malaria free area of the North West Province. The farm consists of two different demographic areas, a flat thorn and grassland area and a mountainous area, that boasts more than 19 species of indigenous trees. The farm has four dams and a solar water point to attract animals at different times of the day. Guests are welcome to go for hikes, or cycle through the premises. Game drives on an open game-viewing vehicle can also be arranged in the morning or late afternoon (times depending on the season). Guests are not allowed to go for drives in there own vehicles. A lookout hide with a view of the grassland, 'Rooidam' and Swartruggens in the far off distance is the ideal place for a sundowner or to spend a lazy afternoon. A variety of game is currently resident on the farm and includes Kudu, Impala, Rooihartbees, Gnu (Blue Wildebeest), Zebra, White Rhino, Buffalo, Hippo, Nyala, Sable, Blesbok, Waterbuck, Warthogs, Giraffe, Bushbuck and a variety of other small game. The bird life is also in abundance. We are proud to say that our wedding venue has been completed recently, and we can cater to up to 60 adults with accommodation included and another 20 people without accommodation, although accommodation can be arranged with neighbouring lodges once Mvubu Lodge is fully booked for the function. We are fully equipped for catering, and decor can be discussed for the event. For more info regarding our wedding and catering services feel free to contact us.